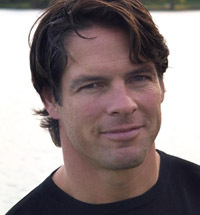 Tim Green was called the “Renaissance Man” of sports by both Sports Illustrated and the Los Angeles Times, and was recently inducted into the College Football Hall of Fame. In 1986, he was selected in the first round of the NFL draft by the Atlanta Falcons where he was a star defensive end for eight years. His athletic experiences and legal education have helped him to become an increasingly popular national television celebrity. After 11 years as an NFL analyst for Fox Sports and National Public Radio, Green recently hosted Fox’s nationally syndicated news magazine, A Current Affair. His other broadcast experience includes serving as ABC Good Morning America’s legal commentator, Court TV’s Pros and Cons, host of Fox Sports Net’s Emmy-nominated show NFL Total Access, and Comedy Central’s Battlebots. Green, a practicing lawyer in the New York firm of Hiscock & Barclay, is the New York Times bestselling author of 12 highly successful suspense novels, including his most recent national best-seller American Outrage, as well the non-fiction New York Times best-seller, The Dark Side of the Game, which was featured on CBS’s 60 Minutes. He is also the author of a memoir entitled A Man and His Mother: An Adopted Son’s Search, which was featured in People magazine, Entertainment Tonight, and ABC’s Prime Time. Green’s commitment to literacy and youth led him to to writing a young adult novel for kids between the ages of 10-14 entitled Football Genius (HarperCollins Children), the first installment of a continuing series. Deep Zone is the latest book in the series. Green, who reads aloud to his own kids regularly, was inspired to write Football Genius by his five children. Green studied English and writing and graduated co-valedictorian from Syracuse University and went on to receive a law degree. He lives with his wife, Illyssa, and their five children on Skaneateles Lake in upstate New York where he coaches football for his 13-year-old son’s team. Further information about Green can be found at his website www.timgreenbooks.com. "Thank you, thank you, thank you! You were absolutely phenomenal and I have gotten numerous emails today from teachers dining your praise. They said that the kids were really moved by your message and that you do not have to have just one goal in life and the kids all now want to be writers and NFL players! We would love to have you back as you were truly amazing!"